It extends along with your growing child! Graco is offering an extra 20 percent off their Extend2Fit Concertible Car Seat, which is originally priced at $200. Use the code GRACOTODAY to redeem! Graco Baby has been in business for over 75 years and that being said, we think they know a thing or two about baby products. Their Extend2Fit Convertible Car Seat protects rear-facing infants from 4-50 pounds and forward facing toddlers from 22-65 pounds. We love this car seat because it's adjustable and provides 5 inches of extra legroom for your growing child! It also has a 6-position recline to help keep your child comfy, and a 10-position headrest that adjust easily as your baby grows. Other reasons to love this seat: it comes with dual cup holders to keep your child's drink close and the seat pad is machine-washable. For more gifts for babies and young children, check out our gift guides for babies, one-year-olds, two-year-olds and toddlers! Please note: This product has not been tested by Shop TODAY or TODAY Parents. 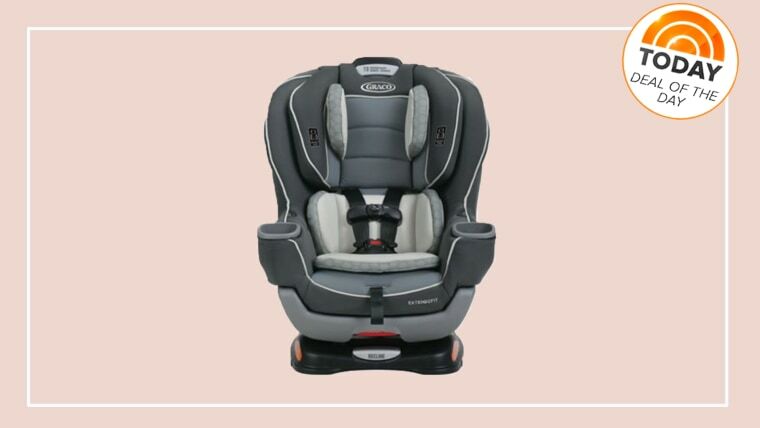 The Graco Baby site does states this seat has been rigorously crash tested to meet U.S. safety standards and US Standard FMVSS 213. Please see their site for more details. TODAY has not verified these claims and cannot be held responsible for any harm resulting in the use of this car seat. *Use the code “GRACOTODAY” at checkout and receive an additional 20% OFF the Extend2Fit® Convertible Car Seat. Offer valid December 19, 2017 until 11:59pm and only at www.gracobaby.com. Offer cannot be applied to telephone orders or redeemed for cash. Offer excludes the Graco 4Ever™ Extend2Fit® 4-in-1 Car Seat and Extend2Fit® Car Seats shown on www.gracobaby.com but not sold through www.gracobaby.com are excluded from this offer. Graco reserves the right to limit quantities. Offer cannot be combined with other offers. No rain checks. Offer good while supplies last.